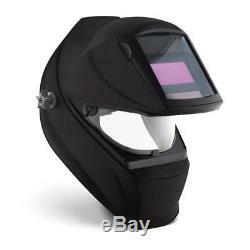 Miller 260938 Classic Series VSi Auto Darkening Welding Helmet, Black Miller Electric Part # 260938. Integrated Grind Shield: Provides nearly 180 field of view while grinding. Three Arc Sensors: Three independent arc sensors provide consisten lens response for obstructed or low amp welding. X-Mode: Electromagnetically senses the weld to eliminate sunlight interference and continuously detects the arc even if sensors are blocked. Durable Shock-Absorbing Gasket: Protects lens from drop impact. Auto-On/Off: Lens automatically turns on at the strike of an arc. The Classic VSi welding helmet is the ideal helmet for farm, home, or hobby use. VSi features X-Mode and three independent arc sensors for unsurpassed arc detection. X-Mode prevents sunlight from darkening the lens before welding starts and low amperage lens opening from obstructed sensors. Features a variable shade 8-13 and light state 3 lens. Includes the ratchet style headgear with precise control. Not recommended for industrial applications or repetitive tack welding applications. Meets ANSI Z87.1+ and CSA standards. Helmet Battery CR2450 (217043), Helmet Cover Lens, Outside (235628), Helmet Cover Lens, Inside (231410), Grinding Shield (245818), Grinding Shield Tear-Away (254278). Auto-Darkening Lens (261826), Headgear (770246). Helmet Bib (253882), Slotted Hard Hat Adapter (259637), Hard Hat Adapter (222003), Helmet Hook (251018). The item "Miller 260938 Classic Series VSi Auto Darkening Welding Helmet, Black" is in sale since Sunday, June 24, 2018. This item is in the category "Business & Industrial\Manufacturing & Metalworking\Welding & Soldering\Welding\Welding Protective Gear\Welding Helmets". The seller is "weldfabulous" and is located in Winona, Minnesota. This item can be shipped to United States, Canada, United Kingdom, Denmark, Romania, Slovakia, Bulgaria, Czech republic, Finland, Hungary, Latvia, Lithuania, Malta, Estonia, Australia, Greece, Portugal, Cyprus, Slovenia, Japan, China, Sweden, South Korea, Indonesia, Taiwan, South africa, Thailand, Belgium, France, Hong Kong, Ireland, Netherlands, Poland, Spain, Italy, Germany, Austria, Israel, Mexico, New Zealand, Philippines, Singapore, Switzerland, Norway, Saudi arabia, Ukraine, United arab emirates, Qatar, Kuwait, Bahrain, Croatia, Chile, Colombia, Costa rica, Dominican republic, Panama, Trinidad and tobago, Guatemala, El salvador, Honduras, Jamaica.